My favorite NFL draft memory is from my freshman year of college. It has nothing to do with who my Chicago Bears took that year (Greg Olsen, 31st overall), or which colossal bust made his way into the top 10 (JaMarcus Russell). No, that year was about testing the durability of a miniature hockey stick when slammed against a dorm room furnace, which is how a friend reacted when his Packers ended up with Justin Harrell at no. 16 instead of Marshawn Lynch, who went to the Bills at no. 12. The stick lost. The reason I always go back to that one has less to do with what happened than it does how many of us were there to see it. For some of my friends, the draft is better than Christmas morning, and for one of us (my Rams-loving former roommate), the only day every season where hope doesn’t seem so ridiculous. This year is no different. When it was clear Jay Cutler’s broken thumb would keep the Bears from the playoffs, I immediately started doing two things: (1) becoming embarrassed at my inability to figure out the draft order, and (2) hoping Michael Floyd had just enough alcohol-related run-ins with the law to fall to no. 19. The second one doesn’t look like it’s going to work out, but I do have three more draft-obsessed observations that I think should. 1. 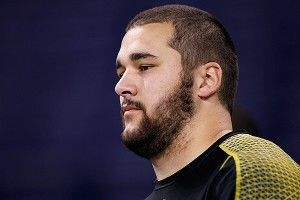 If the Vikings pass on Matt Kalil, someone should be fired. On Monday’s B.S. Report, both our editor-in-chief and former NFL GM Mike Lombardi agreed that to them, and to most executives, it was clear that Trent Richardson is the third-best prospect in this draft. If I had any sort of self-awareness or humility, I would probably defer to Lombardi on this one. It’s a good thing I don’t. Now, saying Richardson is the third-best prospect doesn’t mean the Vikings should take him at no. 3. Minnesota already has a decent running back, and in terms of positional value, selecting a back third overall is a risky proposition. But my contention comes with their point itself. When Stanford visited USC last season, many hyped the game as Andrew Luck vs. Matt Barkley, who were, at that time, the two quarterbacks expect to top draft boards in the offseason. But — in an all-time football nerd move — I was more excited about going to see the two offensive tackles on the top of everyone’s list. Moose Martin from Stanford will be a first-round pick, and he played like it that night. He has good quickness that will likely make him a formidable blind-side pass blocker at the next level, but rarely did he overpower opposing linemen, even in college. Watching Kalil is like watching a high school highlight film. The last college lineman I remember putting opposing players on skates like Kalil did that night was Oklahoma’s Jammal Brown, who did it against USC in the 2004 national championship game. Even for those not coming to the game to watch him play, Kalil’s dominance was evident. At almost 6-foot-7 and over 300 pounds, the guy has incredible feet and does a great job staying on balance in pass protection. If anything has become clear in the last several years, it’s that teams at the top of the draft who already have or can’t get a quarterback are often best served solving a bookend offensive line problem early on. Kalil is the guy who can do that, and Minnesota would be crazy to pass on that opportunity, no matter how valuable they say that pick is. 2. After Andrew Luck, Luke Kuechly will finish with more Pro Bowl appearances than anyone else in this draft. The only time I saw Kuechly play live was Boston College’s first game of the 2010 season. I was there to cover Mark Herzlich’s first game back after recovering from cancer. I left Chestnut Hill that day with two thoughts: (1) That was a moment I’ll never forget, and (2) who the hell was no. 40? No one in college football made plays all over the field like this guy did in his career at BC. He notched double-digit tackles in 33 straight games en route to 527 over a three-year stretch. The only concern about Kuechly (if there was one) was his top-end speed, which was timed at a better-than-expected 4.58 in the 40-yard dash. As Buffalo will apparently move to a 4-3 defense under new coordinator Dave Wannstedt, the need to add youth and speed at linebacker will be critical. In a 3-4, Kuechly would likely be able to put up the sort of ridiculous tackle numbers that between-the-tackle players like Patrick Willis can in San Francisco. But as a Mike linebacker in a 4-3, he will likely turn into the sort of sideline-to-sideline monster that Brian Urlacher has been in Chicago, and likely with the same type of success. 3. Dont’a Hightower will emerge as the best Alabama defender of this draft. Which member of the Crimson Tide’s historic 2011 defense would be the first off the board seems to have changed a dozen times since the end of the season. Early on, it seemed that pass-rusher Courtney Upshaw might sneak into the top 10. Now, it looks like Mark Barron might ride his status as the only decent safety prospect in this draft as high as no. 9. Again, positional value dictates that both of those players (and possibly cornerback Dre Kirkpatrick) should go before inside linebacker Dont’a Hightower, but in the end, I think it will be Hightower who emerges as the superstar from this Alabama group. Along with being an excellent run defender who’s often the first hat on the ball, Hightower showed last season that he can be a force as a pass-rusher from the middle linebacker position. Great defenses often start in the middle, and it’s no surprise that Hightower was often at the center of what Alabama accomplished on that side of the ball. He has more bulk than most other prospects at his position, and in the right system, he figures to be an anchor in the middle of a defense for a long time.